If you think roller shades are just the heavy vinyl numbers used for room darkening, think again. They’ve grown up over the years, and now they’re sophisticated, attractive, and useful. At Treasure Coast Window Fashions in West and North Palm Beach, we’re happy to point our customers toward roller shades—we know they’ll be delighted. In the Hunter Douglas Designer Screen Shades Collection, you’ll find products that can provide excellent UV protection. The fabrics are great as well—there’s a selection of translucent fabrics that allow you to enjoy the view of your outdoors. The Hunter Douglas Alustra® Collection of Screen Shades and Roller Shades offers screen shades that have a contemporary look and roller shades that have light-filtering fabric and are a nice alternative to woven woods. Did you know you can save on energy costs when you treat a window? It’s true. As much as 505 of a home’s heating and cooling costs go out the window unless it’s treated. If you’re concerned about losing your view, at least cover the windows at night or during very sunny summer days. Any shades or blinds that carry a vertical line can be pulled up and totally disappear under a valance or blend into the woodwork. If you don’t have any treatments, you might want to consider a Hunter Douglas Designer Roller Shade. 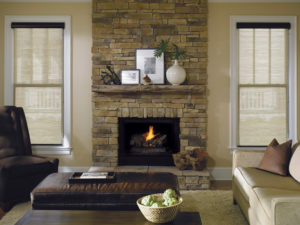 They come in many different colors and textures that will not only enhance your window but also insulate it, keeping your home warmer in the winter and cooler in the summer. When you treat a window, think about whether you want it to be focal point or to blend in to the wall. If you put color on the window, the eye will be automatically drawn to it, and the window becomes the focal point. The more interesting accessories, fabrics and color you have in a room, the less color and texture should be on the windows. When in doubt about color and texture on your windows, less is best. You can always add valances or side panels to a functioning window treatment in a neutral color. We all need to be more energy-efficient. Let Roller Shades or Screen Shades do that in your home! Treasure Coast Window Fashions provides more than just the finest window coverings. Our owners are involved in every project from start to finish to ensure your window covering project exceeds your expectations. We’re proud to serve the greater West and North Palm Beach areas, including Belle Glade, Okeechobee and Hutchinson Island locations. Please contact us at 772-220-8870 or visit our showroom in Stuart, FL, for more information about our products and services. Contact us to learn more.